Over the past number of years, I have noted that spatial econometric methods have been gaining popularity. This is a welcome trend in my opinion, as the spatial structure of data is something that should be explicitly included in the empirical modelling procedure. Omitting spatial effects assumes that the location co-ordinates for observations are unrelated to the observable characteristics that the researcher is trying to model. Not a good assumption, particularly in empirical macroeconomics where the unit of observation is typically countries or regions. , we can modify this equation in a number of ways to account for the spatial structure of the data. In this blog post, I will concentrate on the spatial lag model. I intend to examine spatial error models in a future blog post. is zero, the spatial lag model collapses to the prototypical linear regression model. sum to one. In our simple example, the first row of a contiguity-based scheme would be: [0, 1, 0]. The second: [0.5, 0, 0.5]. And the third: [0, 1, 0]. coefficient values due to omitted variable bias. Fortunately, remedying these biases is relatively simple, as a number of estimators exist that will yield an unbiased estimate of the spatial lag, and consequently the coefficients for the other explanatory variables—assuming, of course, that these explanatory variables are themselves exogenous. Here, I will consider two: the Maximum Likelihood estimator (denoted ML) as described in Ord (1975), and a generalized two-stage least squares regression model (2SLS) wherein spatial lags, and spatial lags lags (i.e.
. Alongside these two models, I also estimate the misspecified OLS both without (OLS1) and with (OLS2) the spatially lagged dependent variable. lattice grid. Second, we assume that neighbours are defined by what is known as the Rook contiguity, so a neighbour exists if they are in the grid space either above or below or on either side. Once we create the spatial weight matrix we row-standardize. 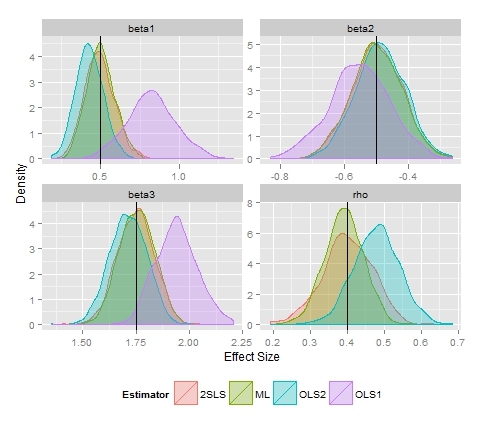 parameter creates an additional bias. To perform these calculations I used the spdep package in R, with the graphic created via ggplot2. Please see the R code I used in the below. To leave a comment for the author, please follow the link and comment on their blog: DiffusePrioR » R.